This page is about the municipality in Lake County. For the north of the City of Chicago, see North Side (Chicago). Location of North Chicago in Lake County, Illinois. 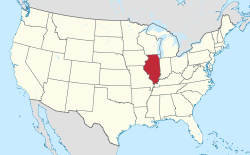 North Chicago is a city in Lake County, Illinois, United States, and a suburb of the Chicago metropolitan area. The population was 32,574 at the 2010 census. North Chicago is home to the Great Lakes Naval Training Center and Great Lakes Barracks Military housing. The city is also home to Rosalind Franklin University of Medicine and Science, which houses the Chicago Medical School, the Dr. William M. Scholl College of Podiatric Medicine, the College of Pharmacy, the College of Health Professions, and the School of Graduate and Postdoctoral Studies. North Chicago in the past was an important center of industry, and that past is reflected within the landscape as the area is still heavily industrialized today. North Chicago is located at 42°19′20″N 87°51′16″W﻿ / ﻿42.322272°N 87.854470°W﻿ / 42.322272; -87.854470. According to the 2010 census, North Chicago has a total area of 7.915 square miles (20.50 km2), of which 7.9 square miles (20.46 km2) (or 99.81%) is land and 0.015 square miles (0.04 km2) (or 0.19%) is water. The city is situated on Lake Michigan. Most of its territory drains directly to the lake, but the western region drains to the North Branch of the Chicago River, and ultimately, since the engineering projects of the 19th century, to the Illinois and thence to the Mississippi River and the Gulf of Mexico. North Chicago includes a Lake County Forest Preserve unit, the Greenbelt Cultural Center and Forest Preserve. Land speculators moved into the area south of what is now the city of Waukegan in the 1890s. Industrial development began almost immediately with a railroad depot being set up in 1892; most notable was the arrival of the Washburn and Moen Manufacturing Company, a major barbed wire maker. The settlement was incorporated as a village in 1895 and as a city in 1901. In 1911, a naval training area was created, the present Great Lakes Naval Training Center, currently the only "boot camp" for Navy enlisted personnel after the closure of facilities in Florida and California. A Veteran's Administration hospital went into service in 1926. This facility was also threatened with closure in recent years, but has been retained on condition of merger with the Naval Hospital. Historically, North Chicago was known for large populations of Eastern European immigrants. With the onset of the "Great Migration", large numbers of African Americans arrived in the city from states such as Arkansas and Alabama, and toward the end of the 20th century, became the best known demographic group. Housing was segregated in the mid 20th century, and until as late as 1957 the African-American section of town lacked sewers and paved roads. Latterly, Latinos have arrived in significant numbers, particularly from Mexico, and now form a notable group in the city, just as they do in Waukegan to the north. It is possible that North Chicago has over time been the most diverse and multicultural municipality in Lake County. At one time, Navy personnel were a major part of the scene in North Chicago, both the "swabbies" (enlisted men) and the officers. Now, with the degeneration of "the Strip", or entertainment district along several blocks of Sheridan Road, sailors are rarely seen north of the railroad trestle. In the fall of 2007, the city finished demolishing the buildings on Sheridan Road between Martin Luther King Drive and the railroad trestle to the north, within the framework of a new development project involving tax increment financing. As of the 2010 United States Census, there were 32,574 people residing in the city. The racial makeup of the city was 47.89% White (36.3% Non-Hispanic White), 29.92% Black or African American, 3.76% Asian, 0.71% Native American, 0.13% Pacific Islander, 13.30% of some other race and 4.29% of two or more races. 27.19% were Hispanic or Latino (of any race). As of the census of 2000, there were 35,918 people, 7,661 households, and 5,577 families residing in the city. The population density was 4,586.3 people per square mile (1,771.1/km²). There were 8,377 housing units at an average density of 1,069.6 per square mile (413.1/km²). The racial makeup of the city was 47.72% White, 36.26% African American, 0.84% Native American, 3.59% Asian, 0.15% Pacific Islander, 7.66% from other races, and 3.79% from two or more races. Hispanic or Latino of any race were 18.24% of the population. There were 7,661 households out of which 46.3% had children under the age of 18 living with them, 48.5% were married couples living together, 18.9% had a female householder with no husband present, and 27.2% were non-families. 21.8% of all households were made up of individuals and 6.0% had someone living alone who was 65 years of age or older. The average household size was 3.09 and the average family size was 3.64. In the city, the population was spread out with 24.1% under the age of 18, 34.7% from 18 to 24, 27.5% from 25 to 44, 9.2% from 45 to 64, and 4.6% who were 65 years of age or older. The median age was 22 years. For every 100 females, there were 156.3 males. For every 100 females age 18 and over, there were 176.3 males. The median income for a household in the city was $38,180, and the median income for a family was $40,485. Males had a median income of $24,480 versus $23,736 for females. The per capita income for the city was $14,564. About 12.0% of families and 15.1% of the population were below the poverty line, including 18.3% of those under age 18 and 15.4% of those age 65 or over. North Chicago census figures include the Great Lakes Naval Training Center. North Chicago Community Unit School District 187 operates public schools. North Chicago High School is the city's high school. North Chicago, by Charles M. Leeks and Mary L. Robinson, in: Local Community Fact Book : Chicago Metropolitan Area (1990). Chicago : The Chicago Fact Book Consortium, Dept of Sociology, University of Illinois at Chicago, c1995. ^ "Geographic Identifiers: 2010 Demographic Profile Data (G001): North Chicago city, Illinois". U.S. Census Bureau, American Factfinder. Retrieved December 7, 2012. ^ Flavin, Genevie (7 April 1957). "North Chicago Homes Project Clears Slums". Chicago Daily Tribune. ^ "North Chicago, IL Population - Census 2010 and 2000 Interactive Map, Demographics, Statistics, Quick Facts - CensusViewer". censusviewer.com. This page was last edited on 9 December 2018, at 16:38 (UTC).